Last week, I had the opportunity to work with two second grade classes at Girls Prep, a public charter school in the Lower East Side. The girls were experimenting with clay, and stop motion animation. You can see the result of their first attempts on YouTube. Visit our studio, take a look around, make stuff. 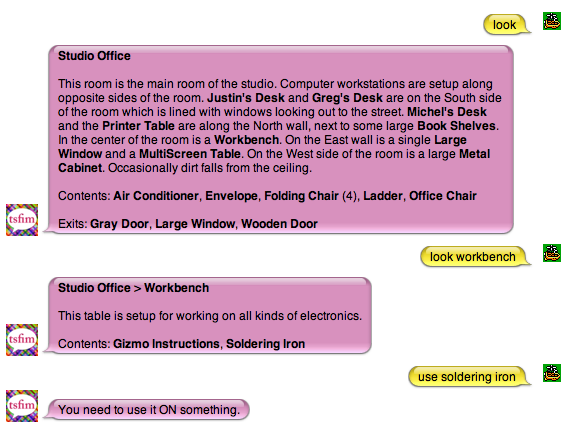 Do it with pure text, all over iChat (or another AIM client). And your friends can come too. Send an IM to tsfimMUD. This thing is ridiculous. The St. Louis chapter of the AIGA recently invited me to join the judging panel for their 14th annual design competition. It was a great opportunity to see some of the best work coming out of the St. Louis design community. The show opens on Friday, April 3. If you are in the area, be sure to take a look. We have posted a new cover for our website that generates patterns by filtering random chance with carefully planned rules. There are currently three sets of rules: one is based on houndstooth, one generates stripes, and one uses vertical symmetry. Each rule set can be expressed in infinite ways; click the button on the bottom of the cover to quickly regenerate. You can select and manipulate the shapes of each design. Try it out. We have been doing some occasional experimenting with iPhone development few months now, but havn’t shown anything because of the developer NDA. Thankfully, Apple has opened things up somewhat now. We have been working with multi-touch surfaces at The Studio, and below is our latest prototype. It is a musical toy that allows you to create temporary, simple string instruments that you can pluck, much like playing a rubber band. Multiple bands can be created and played at once, and more complex instruments can be created with the help of a friend. For a project we completed early this year, we put together a system that simplifies communication between multiple networked computers. We are now using this system to create experimental interfaces that enable users to work both independently and collaboratively. The video below shows a sketch of such an interface. Users can drag colored blocks around with their mouse. They can also drag the shapes to the edge of their screens, where other users can then take them. 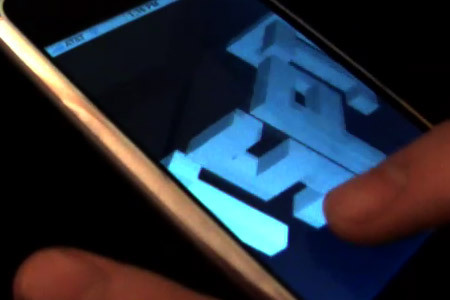 It is also possible for two users to manipulate the shapes at the same time. Through this collaboration, the shapes can be rotated. Over the weekend, The Studio had the opportunity to participate in the Sketching in Hardware physical computing conference. Most of the discussion centered around current and future tools for creating physical computing prototypes, and how to better coordinate efforts between the engineers, educators, artists, and hobbyists working on these problems. So here’s something that I’ve been working with: Node Box. One of the toys I made was based around Tom De Smedt’s Letter Knitter, which modifies font glyphs. My project exports the modified glyphs as xml so that flash can then load them in and display them. 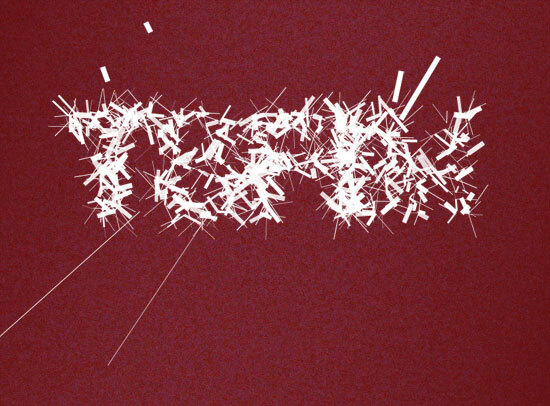 The result can be seen on one of our site covers, “Exploded Type via Node Box”. Aside from access to font paths another handy feature of Node Box is the ability to export PDFs; which you can then bring into Illustrator for all kinds of fun. Over the last month or so we’ve been building out our java code libraries and doing little physics experiments. Here is an output of one of the projects I was working on. It’s a structure built out of springs with graphics mapped to the joints.